Place brie on top of sourdough loaf and trace around it with a knife, cutting a circle out of the bread and remove enough bread in the centre to fit the brie in. Diagonally cut across the bread, about halfway down around the circle and two thirds through the rest so the base is still holding together. Turn bread around and cut in the opposite direction. In a small saucepan, melt butter over a medium heat and add chopped garlic and small thyme sprigs. Allow the butter to simmer and take in the flavour. Generously brush both loaves with melted butter. Place brie into 1 loaf and place both loaves into the oven at 180C for 10 minutes. With a stand mixer, combine the blue cheese, caramelised onion and cream cheese on a medium speed. Add parsley, toasted pine nuts and mix. 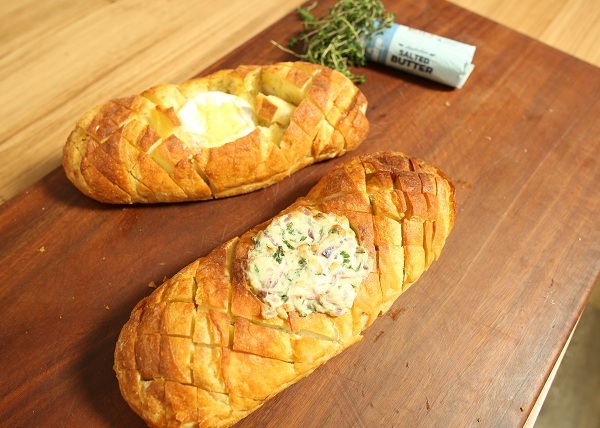 Take loaves out of the oven and fill the second loaf with the blue cheese dip. Place back into the oven for 3-5 minutes or until both fillings have melted and the cheese is oozing out. Enjoy!